Before reading this page, please learn about our circuited magnet systems here so the diagrams on this page will make sense. Because a hidden magnet must project its power through material to attract the opposing magnet, our designs FOCUS the magnetic energy into a beam between the two center pins to increase the pull. 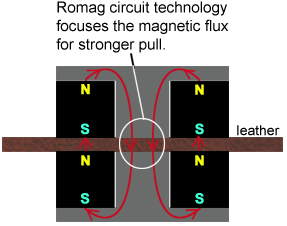 ROMAG's circuited magnetic closures use as much as 95% of the available energy to pull the two sides together. (i.e., pulling power) goes into the air. 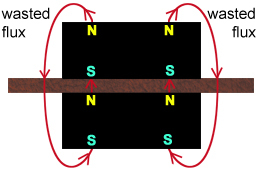 As a result, only about 50% of the magnet's energy is used to hold the two sides together.